The women workers of an electronics factory in Cavite gave the go signal for a work stoppage after a successful strike vote last Tuesday. The strike can be held as early as December 6 and paralyze the production at Lakepower Converter Inc., located at the Cavite Economic Zone. “We are earnestly preparing for a strike against the union busting and unfair labor practices of management. 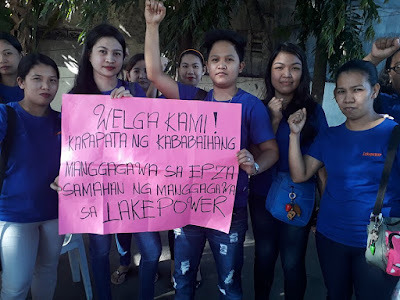 Only the unity and action of workers can stop the vicious cycle of abuse and repression in our factory,” declared Mercy Tanginan, predisent of the Samahan ng Manggagawa sa Lakepower Converter Inc.
A mediation called by the Department of Labor and Employment yesterday to avert the strike did not push through as the company asked to reschedule. Meanwhile the company stated that the termination of the union president and five other unionists has been temporarily deferred.